Since 2004, New Zealand director Taika Waiti has been quietly honing his skills as a filmmaker. Now, with films such as Boy; What We Do in the Shadows, and Hunt for the Wilderpeople having gained critical acclaim, he’s making his name in Hollywood. Set two years after the events in Avengers: Age of Ultron, Thor: Ragnarok sees Thor (Chris Hemsworth) held captive on the planet of Sakaar, ruled by The Grandmaster (Jeff Goldblum). He faces a race against time to return to Asgard, which is being threatened by Hela (Cate Blanchett) and the impending prophecy of Ragnarök, destined to destroy the realm. Phase Three has been established as the cosmic phase of the Marvel Cinematic Universe. With Guardians of the Galaxy II and Doctor Strange setting the tone, it is now time for Thor to re-establish his role as the Asgardian God of Thunder. In contrast to Thor and Thor: The Dark World, the role has noticeably changed in his third solo film. With the Avengers now fractured (and the end of his relationship with Jane), his ties to Earth are no longer as strong, leaving him free to focus on Asgard. Believed to be Odin’s only surviving child, he is now sole heir to the throne. Previously a title he has eschewed, Hela’s appearance forces him to re-evaluate and come to terms with his birthright. With his home facing the very real prospect of destruction, Thor dedicates himself to protecting it at all costs. Following the success of Guardians of the Galaxy, there is an understanding that superheroes don’t need to be super serious and moody all the time. Waiti’s natural, easy sense of humour is a perfect fit – he confidently weaves the laughs into an emotional story with a script deftly exploring the numerous love-hate relationships between the characters, enabling witty banter and quick-flash comebacks. After his surprisingly comedic performance in Ghostbusters, Hemsworth proves that Thor isn’t limited to hitting people in the face with a hammer – or at least, he can be funny while doing so. Thor: Ragnarok also marks the welcome return of Tom Hiddleston as Loki, his first appearance since The Dark World. Both actors have such a natural brotherly chemistry, their characters effortlessly bounce off each other. Through their personal connection, it is easy to understand why Thor continues to offer the hand of brotherhood to Loki – and why Loki will never really break away from his (adopted) sibling. Goldblum hams it up as the quirky Grandmaster, but never goes overboard, which prevents quite a flat character overwhelming his scenes. Ruffalo delivers the most loquacious Hulk seen on screen so far, helping to develop the character beyond a monosyllabic thug, who might have finally found a home on Sakaar. The female stars don’t hold back either. A refreshing – and socially aware – factor of Thor: Ragnarok is its emphasis on the female characters, which drive straight past the stereotypical love interest. Blanchett’s Hela quickly establishes herself as the big bad of the film, slinking her way around Asgard. Her pain at being rejected by her father (arguably for being too good at her job as the Goddess of Death) is palpable and creates a very understandable reason for being so angry. In contrast, Thompson’s Valkyrie is a heavy-drinking warrior-turned-bounty hunter, whose wit and hardened exterior hides a sentimental side that is not overly cheesy. In essence, both actresses make an impression that is not only as equally strong as the film’s male characters, but also complements Marvel’s growing roster of dynamic female roles. 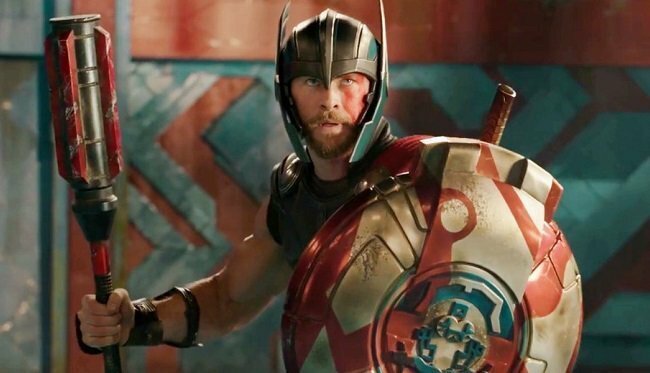 The appearance of Thor: Ragnarok complements the lightheartedness of the script. Its vibrant bold colours and progressive rock soundtrack wonderfully convey the concept of the fantastical alien world of Sakaar, while the fight scenes are imaginative, occasionally dramatic yet thoroughly entertaining. With the long-awaited Black Panther coming soon, Thor: Ragnarok fuels the intense anticipation for the showdown of the cinematic universe. With its sharp dialogue and rock soundtrack, Waiti has delivered one of the funnest films in the MCU. Thor: Ragnarok is out in UK cinemas on Tuesday 24 October.